Mount Fairweather is a “shining mountain of promise” standing head and shoulders above its neighbors on the boarder between British Columbia and Glacier Bay National Park in Alaska. For many years, airdrops and glacier landings were forbidden, and “sea to summit” was the standard practice. But with the recent allowance of glacier landings, the approach from the Upper Grand Plateau Glacier has become the standard route for those who want to achieve Mount Fairweather’s lofty summit. But even then, Mount Fairweather’s remoteness, lack of non-technical routes, and almost continual snowfall (reputed to exceed 100 ft/year) all contribute to keep it wilder and less visited than any other mountain of equal size in North America. In difficulty, Mount Fairweather may be considered a cross between Mt. Rainier and Mt. McKinley. Its nearness to the Gulf of Alaska (one can actually look down from its summit and see the crashing Pacific surf), contributes to particularly foul weather. The extreme snowfall contributes to significant crevasse and avalanche hazard. This bad weather is also a problem for flying on and off the glacier. Some expeditions have never set foot on the mountain after waiting days for flying weather. Flying services for Mount Fairweather include Mountain Flying Service and Earth Center Adventures, both located in Haines, Alaska. The route from the Upper Grand Plateau Glacier, first climbed in 1977, begins with a glacier landing at 9,000 ft. Gradually ascend the Grand Plateau Glacier to the valley between Mount Fairweather and its West Peak. There is serious avalanche danger in the valley between about 11,500 ft and 12,000 ft where avalanches release any time of day from both Fairweather and its West Peak. 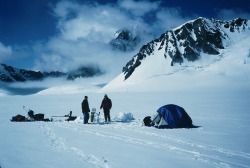 The third camp should be located above the avalanche zone at about 12,500 ft. From this camp, the summit can be reached in a single long day (possibly 12-16 hours) by ascending the valley to the col between Fairweather and its West Peak, and following the west ridge to the summit. Snowshoes, generally used up to the col, can be exchanged for crampons for the assent of the west ridge. Conditions on the ridge vary from occasional deep powder to hard wind-scoured ice. Return to the col, the valley, and the Grand Plateau Glacier by the same route in reverse. The difficulty of summit day varies from year to year. In June 1995, the route was not overly challenging – crevasses were well covered, and only one belay was needed on the West Ridge. But climbers in 2008 reported almost impassible exposed crevasses and dangerous snow bridges. Crevasses will probably be less of a problem early in the climbing season. The climb from landing site to summit and return will take 5-10 days, depending on weather.